Craig Kirchhoff is Professor of Conducting and Director Emeritus of University Bands at the University of Minnesota where he conducted the University Wind Ensemble and guest conducted in the University Opera Program. Professor Kirchhoff coordinated the graduate program in Wind Ensemble/Band Conducting and guided all aspects of the University of Minnesota wind band program since 1993. Born and educated in Wisconsin, Mr. Kirchhoff brings to his position a wide knowledge of both traditional and contemporary literature. He has won critical acclaim from composers Dominick Argento, Warren Benson, William Bolcom, Henry Brant, Susan Botti. Elliott Carter, Michael Colgrass, John Corigliano, Michael Daugherty, Karel Husa, Libby Larsen, George Perle, Vincent Persichetti, Carter Pann, Stephen Paulus, Kevin Puts, Einojuhani Rautavaara, Gunther Schuller, Joseph Schwantner, Steven Stucky, Elliott Schwartz, Frank Ticheli, Dana Wilson, Chen Yi, and others. 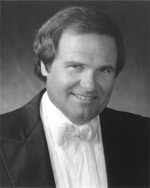 Prior to his appointment to the faculty of the University of Minnesota, Professor Kirchhoff served in a similar capacity as Director of Bands at The Ohio State University for fourteen years, as Director of Bands at Washington State University for two years, and Associate Director of Bands at the University of Wisconsin-Milwaukee for one year. Mr. Kirchhoff was the recipient of The Ohio State University Alumni Distinguished Teaching Award and The Ohio State University School of Music Distinguished Teaching Award. Professor Kirchhoff is an advisor to the BandQuest Series published by the American Composers Forum, he joins James Galway, Eddie Daniels, Wynton Marsalis, and Dawn Upshaw on the Advisory Board for SmartMusic produced by the MakeMusic Corporation, and he serves as the Artistic Advisor for the Windependence Wind Band Series published by Boosey & Hawkes. Professor Kirchhoff has appeared as guest conductor, clinician, and lecturer throughout the United States, Australia, Canada, China, Japan, Taiwan, Europe, and Scandinavia. He enjoyed a long association with the Tokyo Kosei Wind Orchestra during Frederick Fennell’s tenure as Music Director and he has recorded with them on the Kosei Publishing label.